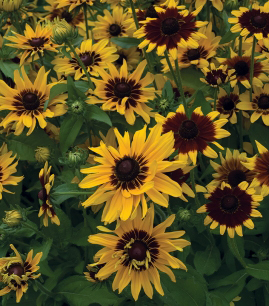 It would be Denver Daisy (rudbeckia denver daisy). Denver Daisy is perennial which means I don't have to replant every year, It is not invasive but will spread to fill an area over time. It blooms profusely from May till frost. Butterflies and birds love it. The Goldfinches eat the seeds just like they do sunflowers but Denver Daisey doesn't grow as tall or take up as much space as sunflowers. They do love full sun but I have them in the shade too. I even grow them in a big pot on my semi-shaded deck so I can watch the birds and butterflies from my dining room when we eat breakfast. It starts my day off with a smile. I usually have them for sale at Mimi's Greenhouse in the spring.